If you’re an avid sports enthusiast, owning a personalised sports T-shirt can surely boost your motivation. For a sports company or a company organising a sports event, having a logo on the T-shirt is a great way to promote your brand! In our catalogue, you’ll find a vast choice of models and colours that can perfectly fit your brand requirements. We have all the sizes you might need from XS to 2XL available for both men and women, and if you’re organising an event for kids, we’ve got kids’ sizes too! We are proud to say that we can offer all possible printing techniques for garments. 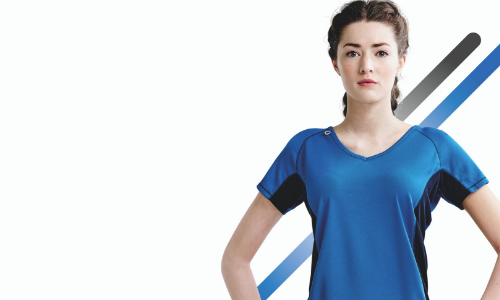 For polyester sportswear, we would recommend choosing between screen printing, Dye sublimation and Cad Cut Vinyl. Dye sublimation can be used on white sports T-shirts for both all-over and A4 prints. There’s also no minimum order for it, which makes it perfect for small quantity orders. If you have a design that consists of one or two colours you can also use Cad Cut Vinyl printing. There’s no setup cost for this technique, and we can print any design up to A3 size. If you’re not sure, which printing technique to use on which garment we have a team of experts who are happy to help! You can also use our online service to design and buy sports T-shirts up to 25 units. If you need more than 25 units, request a quick quote, and we’ll get back to you within 15 minutes. Thanks to our 20+ experience in the market, we can offer you the choice to personalise products from the biggest and best international brands. Our catalogue has an extensive number of T-shirts that are fully printable and can suit any of your needs.